Is there a better alternative to TextSweep? Is TextSweep really the best app in File Management category? 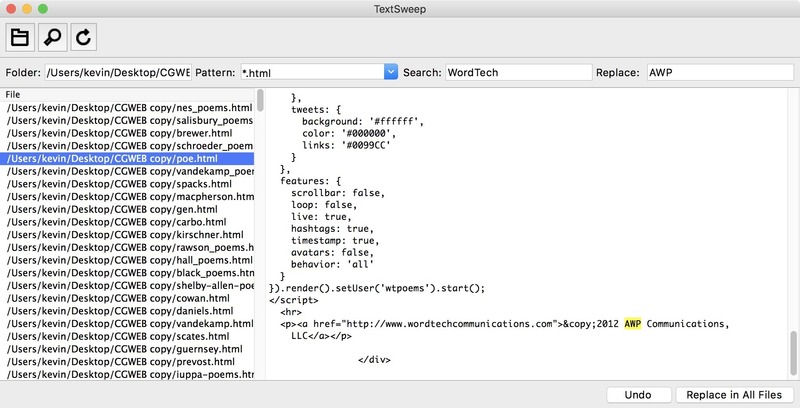 Will TextSweep work good on macOS 10.13.4? TextSweep is a simple but powerful application for searching and replacing text in multiple files, quickly and easily. Using an elegant, intuitive interface, TextSweep allows you to select a directory, specify which files will be modified, enter a search and replace term, and see the changes instantly. Migrate to new source code server. TextSweep needs a review. Be the first to review this app and get the discussion started! TextSweep needs a rating. Be the first to rate this app and get the discussion started!